Doomfist, Overwatch’s new cybernetically-enhanced Offensive villain, has just released, letting players finally test the anticipated addition. See what we have on upcoming Overwatch heroes. It’s official – Doomfist is out now, along with Overwatch patch 1.13. 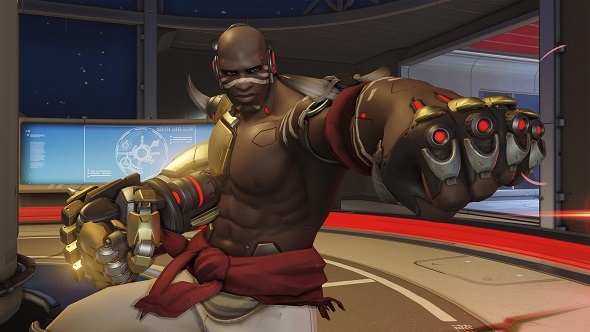 Doomfist, as his name suggests, kills people with his fist, which is also a short-range shotgun. After charging up, Doomfist’s big glove propels him forward. Followinga nerf shortly after his release, its maximum range is a little over 20 metres. It’ll hurt any enemy it hits, and do bonus damage if they then connect with a wall – up to 250 damage at maximum, in fact, which is a one-shot kill against most non-tank heroes. Launch your enemies into the air with a swift uppercut to the chin, singling them out for a barrage from your teammates. Tap E and Doomfist leaps forward. When he slams into the ground, he pulls enemies close, ready for a blast from his hand cannon. Doomfist leaps into the air and crashes down like a meteor, causing significant damage to anyone who’s in the way. Enemies can see where he’s aiming and act accordingly. When he deals ability damage, Doomfist gets a personal shield that must be destroyed by enemies to continue to do damage, making him perfect for guerrilla tactics.